When a pressurised water pipe leaks the water flows out which causes the pipe and surrounding material (mud, concrete tarmac) to vibrate. This sound, or vibration, is transmitted along the pipe (structure borne water leak noise) and through the surrounding material (ground borne water leak noise). 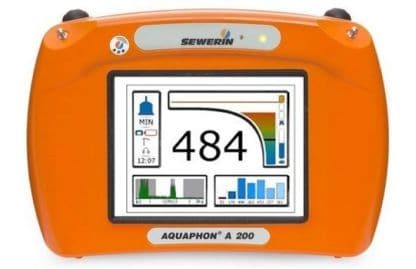 With the Aquaphon A200 ground mic set listening for these water leak noises is now easier than ever before. Frequency strength – which ones are loudest. Wire free microphones digitally transmit noise to the headphones. There are NO CABLES between either the microphone and the receiver or the headphones. This leaves the user complete freedom of movement providing great comfort. Powered by rechargeable batteries providing a full days use. A real time graph of the strength of the frequencies of the sound being heard is displayed. This allows the user to see which frequencies are the strongest. Higher frequencies tend to occur closer to the leak. By simply tapping on the screen frequencies can be silenced allowing the user to focus on the water leak frequencies that matter. 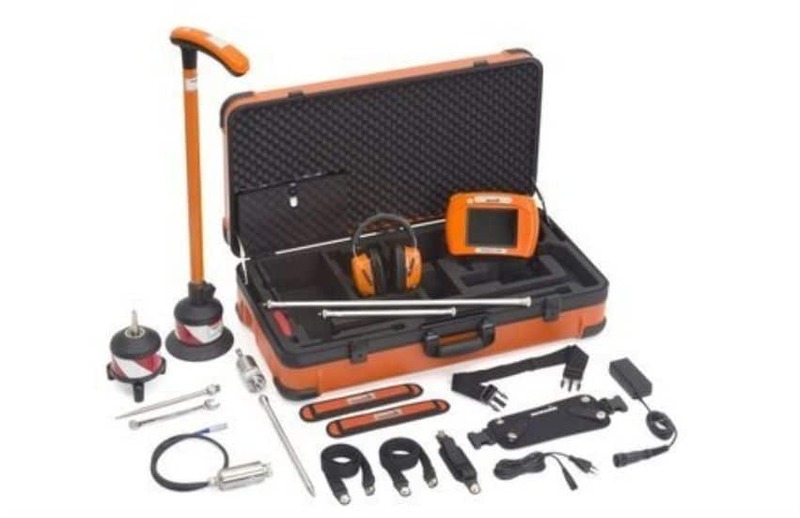 Pre-location of leaks is carried out using the TS 200 with the TM-200 test rod mic (listening stick) a highly sensitive wire free digital microphone for listening for water leaks at valves and hydrants. When you find a fitting with constant leak noise you know you are close to the leak. The TM 200 includes an LED to illuminate the valve chamber allowing quicker cleaner contact with the spindle. 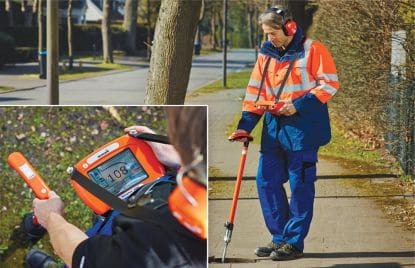 When the section of pipeline with the leak has been identified, or if you choose to walk the surface of the pipe to find the water leak, pin pointing can be carried out on smooth surfaces (tarmac concrete and block paving) using the uniquely wind insulated ground microphone BM200. It is a digital wireless microphone that can be operated from the receiver, “hands free”, or from the carrying handle, as you prefer. On uneven or off road surfaces the BM 230, complete with its removable ground spike, is the perfect choice; its tripod foot ensures stable contact at all times, reducing interferences from unnecessary vibrations. The BM 230 can also be used on paved surfaces. When working indoors or in tight space the Universal microphone UM200 can be a useful option. It can be used with a tripod or a listening stick attached. It includes an LED to illuminate dark areas.